LOS ANGELES, CA – As the Los Angeles Kings step to the ice against the San Jose Sharks on Thursday night at Staples Center, only two things are certain after 72 games: the organization will miss the post-season for the third time in the last five seasons and interim head coach Willie Desjardins is coaching his final 10 games behind the L.A. bench. With some off-season plans already in motion, there hasn’t been more uncertainty enveloping this franchise in over a decade. The plummet from playoff contender to lottery pick status has been a brutal and shocking watch even for those who rightly predicted (not me) the team would regress based on last season’s mediocre second half and stunning four-game playoff exit against the Vegas Golden Knights. Imagine placing a few dollars in October on Drew Doughty finishing the season with a minus-30 rating. You could have bought next year’s season tickets cashing in on that longshot bet. Jeff Carter and Tyler Toffoli 22 combined goals? “No chance,” you would have said on Opening Night. If you want to reminisce about the good old days of That 70’s Line, add Tanner Pearson’s production that got him traded out of Los Angeles and you still come up with 22. In the best of times, the Kings were never a dominant offensive team so it should have been safe to assume the Kings would rely on the combination of defense and goaltending that won them the Jennings Trophy last season to grind out wins, right? You probably made a visit to urgent care to treat the whiplash from witnessing them free fall from first to 22nd in the goals-against column. A large majority of the carnage that has the Kings just two points ahead of the Belleville, nee Ottawa Senators was caused by the man I affectionately refer to as WD-40 since his installation as interim coach just 13 games into the season. The debate can linger on if John Stevens’ dismissal was premature and perhaps the end result would have been the same had Stevens been given a longer leash. In retrospect, GM Rob Blake’s decision to make the replacement an interim appointment severely limited the pool that produced Desjardins as the best candidate and sealed this season’s fate with still 69 games remaining. WD-40 managed to lose the locker room in a new Olympic and World record time. Practices were disorganized and game performances mirrored those efforts; when the players performed poorly, they were told they were playing well and there were no consequences for sub-par efforts, no benching or visits to the press box. Despite his low-key personality, Desjardins managed to either lose the respect of or alienate the leadership group (not that the group is absolved of blame), so through addition by subtraction alone, the organization will be better suited to compete next season. As for coaching possibilities, you’ve heard the names before, all from the Mike Babcock coaching tree, his current assistant D.J. Smith (who will be moving on after this season), Marlies bench boss Sheldon Keefe (my early favorite but reportedly closing in on an extension with Toronto) and the choice that is the most logical, Todd McLellan, which I reported earlier this month. McLellan was set up to lose in Edmonton, collateral damage from the Peter Chiarelli era/error and McLellan’s long tenure in San Jose goes all the way back to Blake’s playing days, a time that still resonates with the Kings GM. While there is chatter about current assistant Marco Sturm being elevated, given that the selection of this coach likely determines Blake’s legacy as a General Manager, I can’t envision the last bullet in his chamber being a first-time coach with one-year of NHL experience with the 30th place team. The organization does see potential in Sturm, so at worst he could be warehoused with the Kings AHL Ontario alongside affiliate alongside Mike Stothers if the incumbent wants to bring in an entirely new staff. Clearly Blake’s best shot at success as an NHL executive simply can’t be a coaching tree of Stevens-Desjardins-Sturm. It’s hard to envision Joel Quenneville jumping on the train at this stop (as an aside, I personally like the exacta of Steve Yzerman-Q in an attempt to bring the glory days back to Detroit) and I don’t see Alain Vigneault, while certainly qualified, being the best fit for the Kings given the impending shift of the roster. As poor a choice as Desjardins was, he had co-conspirators on a squad that stands to accumulate less than 70 standing points. Assuming the continuing influx of youth to the roster, the leadership group must do a far better job next season. One leader in particular has to reestablish himself as an elite player and establish himself as a mature role model for next season. If you choose to use the warts of this lost season to explain Drew Doughty’s performance, it’s your prerogative, but the reality is that his performance hasn’t been worthy of his $7 million check much less the $12 million (and $11 million cap hit) he will earn when his eight-year extension kicks in July 1. If you want to ignore a -30 rating (a neighborhood he should never visit) and his lack of offensive production as an anomaly, that’s fine, but if you watched him closely, he hasn’t been the difference maker of past seasons and has not made the players around him better – there have been too many nights where “pedestrian” describes his play. Maybe his performance lost its edge when night-after-night the games were meaningless, but when the net pay of a $10 million signing bonus hits his bank account this summer, he must be their best player next season. Yes, Anze Kopitar wears the ‘C’ and has suffered through a sub-par season as well, but it’s Doughty who is the most visible member of the organization and as he turns 30 years old next season, he can no longer be the precocious dude in the room. While his on-ice legacy is cemented through his accomplishments, there is another level he can achieve. His career now must evolve into one where he mentors and develops the fledging blueline talent the organization has and will obtain. When Doughty signed his deal, he proclaimed he wanted to stay in Los Angeles and win more championships. With his ability to obtain additional rings impaired as the organization undergoes a transition, he stated to me during All-Star Weekend that he was ready for whatever was next, and he must hold to that promise. I am not suggesting that he extinguish his competitive fire, those flames still need to be stoked, but he must find a way to add some ice to his personality mix to become a steadying influence on the next generation of Kings. Assuming Blake selects a coach who will command the room again and motivate a group that defines the word “disengaged,” the heavy lifting of the roster recreation is Job 1A and where the months-long debate about “Lose for Hughes” is housed. Though Blake got a solid return (and you never really know about the success of a trade until a couple of seasons removed) for Jake Muzzin, Los Angeles’ core still closely resembles the one that skated off the ice after the Game 4 loss to Vegas last April. 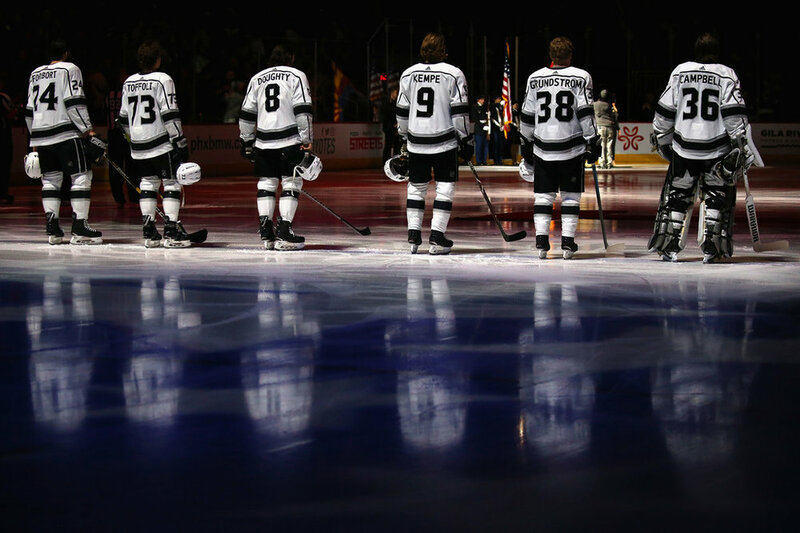 There were significant conversations leading up to the trade deadline, but Toffoli, Carter, Alec Martinez and Jonathan Quick were still in L.A. on the morning of February 27. All except Toffoli are over 30 years of age and that is a key as to the strategy which management will deploy in the coming weeks. If you ask the players privately about their chances for a bounce back season for 2019-20, they will tell you they are no worse than the Arizonas, Minnesotas and the Colorados of the Western Conference. With a couple of key changes and additions, while they might not be able to contend with the top of the conference, they can be in the thick of things for a post-season berth. That prevailing thought from inside the room begs the question: What will be the level of participation in free agent frenzy for the Kings come July 1? There are legitimate impactful options in a shallow UFA pool when it comes to quality. They could go all-in and make a big money play for the man at who will be at the top of the UFA board, current Columbus Blue Jackets left wing Artemi Panarin. Assuming Carter is not on the roster (more on him in a few), they could look at the Islanders’ Brock Nelson as a solid 2C should he not re-up in Brooklyn/Nassau County. They could shore up the right side of their blueline by going after Winnipeg Jets defenseman Tyler Myers if his disdain for Manitoba winters has him looking for warmer pastures. No Bread. No Brock. No Blueline. Soon after the Kings putrid start, management made the decision to move towards a significant rebuild that will have this team in non-contender status for at least next season. The process will occur even if the four ping pong balls fall in their favor on April 9 to give them the No.1 overall pick. There will be no big free-agent plays or trades bringing in established star talent. Meetings with internal staff and a select group of season ticket holders as recent as this past Sunday have revealed the short-term vision. Before we present the plan, one thing is certain: for those who may question his ability as an NHL General Manager, it’s my understanding that Blake has the full confidence of team president Luc Robitaille to transition this team. The organization is transparent about the poor quality of the on-ice product, admitting fans were subjected to “boring hockey” this season. That admission supports holding the line on season ticket prices for next season (full transparency – we hold a pair of season tickets). To no one’s surprise, the aging of this roster will be addressed and the move to a much younger roster (age target 24-25) is the goal for next season. Any player acquisitions will come in at or below the age target. Towards the goal of achieving a young roster, one buyout of a veteran (to be determined) is expected to be executed this off-season, if a trade is unavailable. The return to contender status will take multiple seasons to achieve and simply making the playoffs to get eliminated in the early rounds is not the path, it’s Stanley Cup or nothing. The current core talent on the roster, while not necessarily in full decline, is not suited to win in today’s NHL. Gabe Vilardi is still a big key to the future of the organization and they are doing everything possible to get him on the ice for next season. The organization is very high on last year’s first-round pick Rasmus Kupari. By virtue of their No Move Clauses, Doughty and Kopitar are truly the only two untouchable players. The movement to a more balanced team, not one that just relies on goaltending and defense, must be achieved. While they claim not to have been in “Lose-For-Hughes” mode, they REALLY like Jack Hughes. On the prospects of a buyout, the two targets are Carter and Phaneuf. Phaneuf has the shorter remaining term of the two (two years vs. three), but with his NMC protection, he cannot be waived. If the Kings were to execute a buyout, the cap hit effect would be below, courtesy of our friends from Cap Friendly (ouch on that second year). The best route for the Kings would be to buy out Phaneuf and try to find a taker for Carter via trade – the problematic part of that equation is that there were zero calls for Carter at the trade deadline, we confirmed. While the trade market is expanded in the off-season and a change of scenery may help Carter find the motivation he lacked all season, a $5.3 million cap hit for the next three seasons (he’s only owed $7 million cash in total), may be only attractive to a team like Ottawa who needs to hit the salary cap floor – though there are teams willing to take on a higher-priced salary/cap hit something is added to sweeten the deal. Assuming the worst-case scenario for Carter, no takers or a trade destination to a location that will re-ignite chatter of a retirement, the downside isn’t as costly as one would think. The Kings could simply waive Carter with the hope that some team would take a flyer on him with zero acquisition cost, a move they would welcome given their current direction and the player’s lack of engagement after returning from injury. If there was no waiver claim, it’s very unlikely Carter would report to the AHL, even with $7 million owed to him; the prospects of riding buses to Bakersfield and Stockton has to be unappetizing to a player who has earned almost $70 million in his career and lives peacefully in Manhattan Beach. So, what about the recapture penalty? Doesn’t that come back to bite the Kings? By availing ourselves of the wizards at Cap Friendly again, the recapture is manageable assuming an increasing salary cap ceiling over the next three seasons. Cap Friendly has calculated that if Carter would choose to walk away this summer, the Kings would incur a recapture penalty of $2,755,939 in each of the next 3 seasons. A Phaneuf buyout and a Carter retirement would be painful in 2020-21 with a tab of almost $7 million of combined dead cap space to digest, but assuming a younger roster with a significant number of players on entry-level deals and no big UFA market moves over the next two seasons, it’s executable. From what I’ve gathered, there is no question that if the Kings land the first-overall pick, they will select Hughes. Though you may have read some recent mock drafts that place him below Finnish winger Kaapo Kakko, he is the player they desire. While he may not be a generational talent of a Crosby or McDavid and has had some injury issues, he is a dynamic player who could evolve into the next Patrick Kane or Johnny Gaudreau. What makes the Kings desire for Hughes intriguing is what occurs if the lottery results in Los Angeles winding up with the No.2 overall pick. Could the Kings be aggressive enough to engineer a deal to switch slots and to land Hughes? That depends on the team ahead of them and what their needs are. The Kings have lost 18 of their last 20 with five of their last 10 against current playoff qualifiers, it is safe to assume they will not elevate above 30th place. Given that scenario, the lowest pick they would receive is the fifth-overall selection, and even in that scenario, a move to first-overall is not out of the question even at a premium price. Could you imagine if the Ducks won the lottery? Given how much Kings fans have suffered this season, let’s assume their Freeway Faceoff rival that doesn’t land the first-overall and Blake can entice a team to swap picks inside the top-5. If you added Hughes, Vilardi and Kupari next season to the roster, while there would be growing pains aplenty, the organization would be on track to a legitimate rebuild and that’s without adding any assets from a prospective trade of Toffoli or Martinez. It would also allow the organization to spend high draft picks over the next two seasons to gather defensive talent. But when you talk trades, you have to address dealing the player who would return yet another organizational target, an additional 2019 or 2020 first-round draft pick. Quick has been the backbone of this organization, a warrior who defied the odds and emerged as an unheralded third-round pick from the 2005 NHL Entry Draft. With the development curve of Jack Campbell and Cal Petersen at its end and assuming the Kings will not be contenders for at least two seasons, Quick is now a luxury for the franchise. What favors the Kings is the fact that every post-season you can bank on a half dozen teams looking to improve their goaltending situation. In Philly, Carter Hart needs a mentor and the Flyers may have already considered Quick as an option. If Calgary is upset early in the post-season and with Mike Smith (a pending unrestricted free agent) and David Rittich (an unproven playoff performer), Quick would fit there, as well. Carolina has two pending UFA goalies and Scott Darling languishing in the minor leagues. And if you really want some intrigue, while it wouldn’t help their 2020 draft status, could you entice the Avalanche with Quick to move from 1 to 2 in this draft if Ottawa’s slot wins the lottery? Quick’s four remaining years on his deal may appear to be a barrier to a trade, but without NMC protection he could be exposed in the Seattle expansion draft in June 2021. It’s fair to envision a scenario like what occurred with Marc-Andre Fleury in Vegas, so the acquiring team can look at it as a two-year, not four-year, commitment, making it more likely (particularly in the case of a contending team) to surrender a first-round pick. If you add another first round pick to the mix of the plan about to be executed. The future may not be so cloudy in Los Angeles, after all.